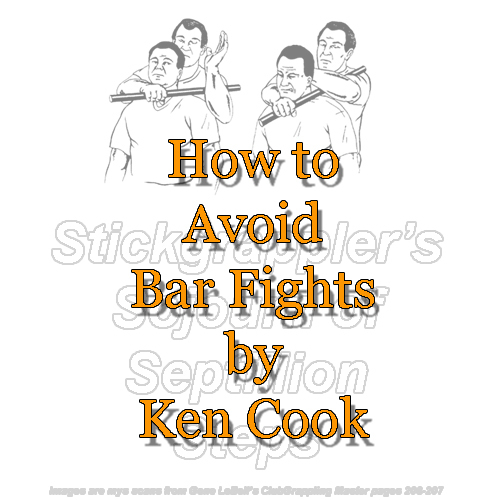 The best way to avoid bar fights is to avoid bars entirely. There are at least four great reasons for doing this. Liquor is cheaper at home. You don't have to drive home if you're already there. Most people are swinish louts at the best of times. Adding alcohol doesn't help. The carrying of arms in bars is illegal almost everywhere. But if you find yourself in a bar and find yourself confronted by someone absolutely determined to get in a fight with you, "Verbal Jiu Jitsu" might work. Might. In my younger years, I got in several altercations that I tried mightily to avoid using just the techniques shown above. One of them for no more reason than I won a game of pool the other fellow had expected to win himself. There were no stakes on the game but that did nothing to dissuade him from trying to fracture my skull with his pool cue. He was drunk, I wasn't, and the bouncer knew me. After the altercation he came up to me and said, "Hey man, you'd better split, that girl who just walked out is using the pay phone (Yeah, I know, I'm dating myself) to call the cops." He told me, "Because the bartender wouldn't let her use the bar phone to do it." If you MUST drink in a bar, realize you are at risk no matter how nicely you behave. Drink only in moderation. You may need your motor skills. Always be on good terms with the bartender and the bouncer! Always leave the instant an employee suggests it. It's in your own best interest.